This is a promotional post. Opinions are my own. Post written by Erinn Sluka and shared by me. When I am traveling anywhere, there are a few beauty items I carry besides my everyday makeup and hair products. Those would be my flat iron and sun protection products. For the kids, I have travel size sunscreens, but when I use those for myself on my face and neck it leaves my skin so oily and if I want to use my moisturizing or makeup products with it I can't get it to stay on and look good. ColoreScience Sunforgettable Brushes allow me to have an SPF50 protection under my daily beauty products and each colore tube falls within TSA size guidelines for packing. As for my hair, I tend to travel to warm spots or for date weekend getaways with my husband and I love my flat iron for quick hair fixes. If I need to add a bit of volume, turning under a few sections of my hair with a flat iron accomplishes that in minutes, I also can run it down my hair quickly for a smooth look when the sun or swimming is causing my hair to frizz or to not cooperate. The ColoreScience Sunforgettable Brushes come in single tubes or a multipack like this set above. You can keep one in your purse, travel bag and bathroom for easy access when you need to protect your skin from the sun. The ColorScience Sunforgettable is a mineral formula and great for any skin tone. I can use this in place of my powder foundation. It is a high proprietary blend of minerals with no fragrances, mineral oil, alcohol or talc. It is a broad spectrum UVA/UVB sunscreen and is waterproof for up to 80 minutes. Just brush on and stay skin safe through the day. This limited edition style of Ion Smooth+ iron and brush combo comes is a fun finish of Rose Gold. This set is in in honor of the 2015 Big Night Out collection from Paul Mitchell. It's temperature is digitally controlled in an LCD display and heats up to 410 degrees in 60 seconds. The brush is great with even teeth that keeps hair from pulling or tangling. Having sun protection and a quality flat iron makes your traveling so much easier when they offer effortless and effective results. They pack well wherever you may travel to. 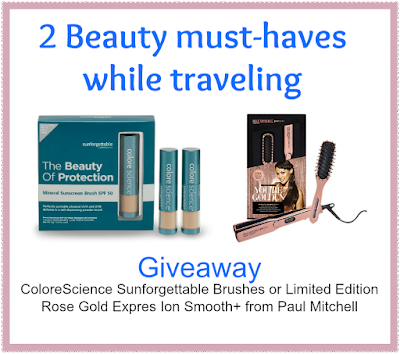 You can enter on both giveaway widgets below to win these beauty must-haves! Open to US and ends 7/14. Good luck. The SUNFORGETTABLE® LIP SHINE SPF 35 inspires me, love to try it! The Setting Mists are interesting to me. The Clarifying would probably be my best choice. Wow! I can't believe that it Heats up to 410°F in 60 seconds. That is amazing. Lately I have really been liking powder foundation. With that in mind, I would like to try out the Pressed Mineral Foundation compact at Colorescience. It's kind of cool that the Express Ion Smooth+ has a digital temperature read. It heats up so quickly and I love that it has dual voltage so it can be used worldwide. I like the Sunforgetable Lip Shine. The How 'Bout Them Apples? Lip and Cheek Cream Palette intrigues me. I like the mineral corrector palette and the pressed mineral powder. I love the Paul Mitchell Express Ion Smooth, definitely something that I could use. Not only is this product efficient in quickly heating up and creating a perfect look, it creates a healthy look and feel to the hair. 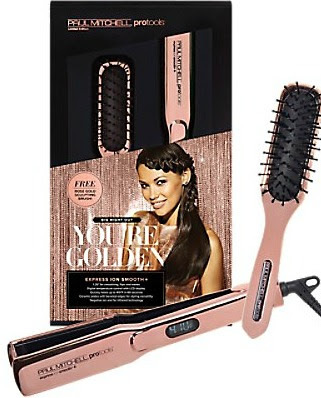 Much better than other straighteners and smoothers out there! I love that! Even Up Clinical Pigment Perfector sound awesome. I like the Skin Mattifying face primer SPF20. I like the lip balm! I am interested in their Mineral Corrector Palette.